The march from the city centre to parliament was led by the Civil Coalition for the Application of Article 19, which is reportedly made up of some 500 NGOs, and was joined by civil society organisations, lawmakers, rights groups and lawyers. Participants carried banners demanding a "comprehensive review of all discriminatory laws", "women's safety in public places", and "equality as a right, not a privilege". 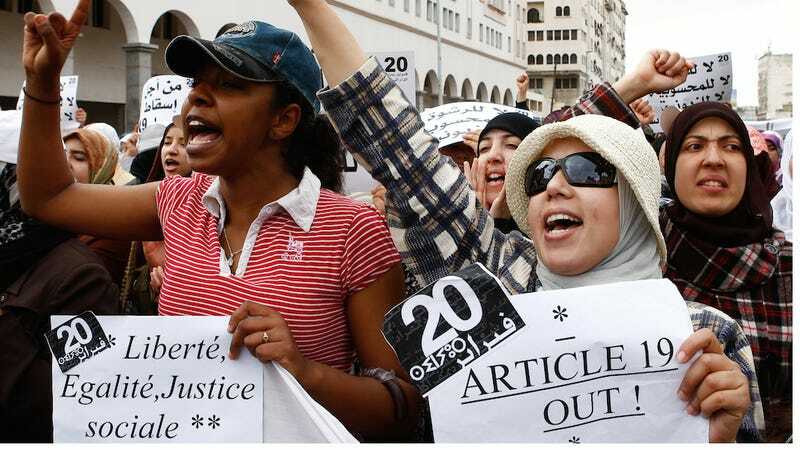 Article 19 of Morocco's 2011 constitution guarantees that "men and women enjoy on an equal footing civil, political, economic, social, cultural and environmental rights and freedoms". 62% of women in Morocco between 18 and 64 have faced some kind of violence, so it's incredibly difficult to see women caught in a limbo where a law guaranteeing some form of safety exists but is kept out of reach by a stalling government.